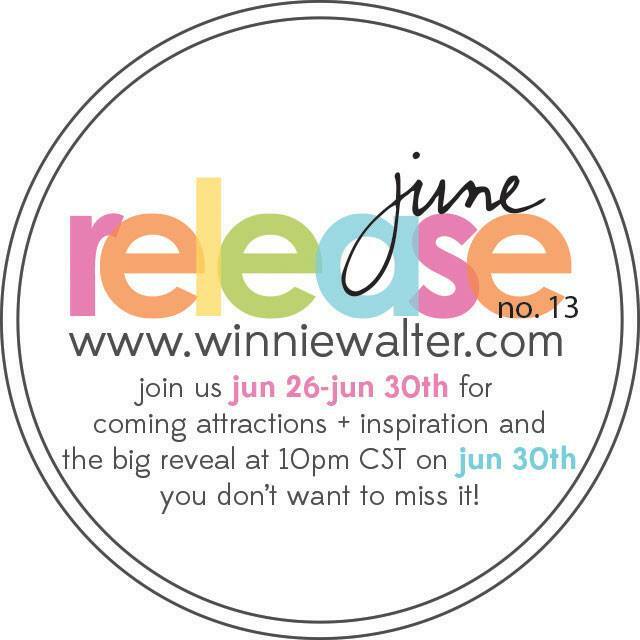 This is Day #4 of Winnie & Walter’s June release. How exciting! Hope you have enjoyed the sneak peeks until today. All the new products will be available for purchase at Winnie & Walter Store. 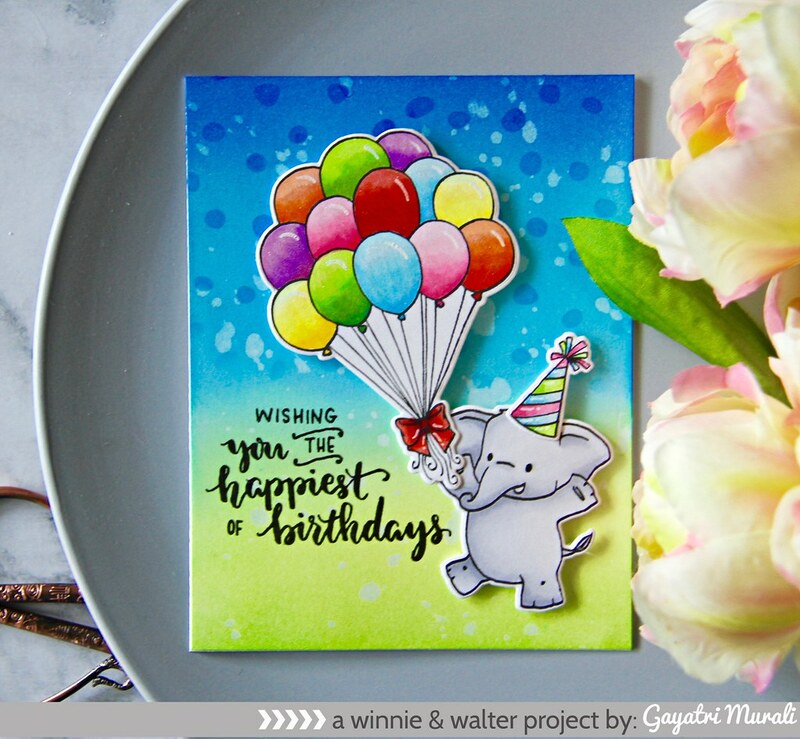 I am showcasing a new stamp set called Happy Dance by Evelin T Designs. This stamp set has coordinating dies which is very handy. I love this set and enjoyed colouring the images. 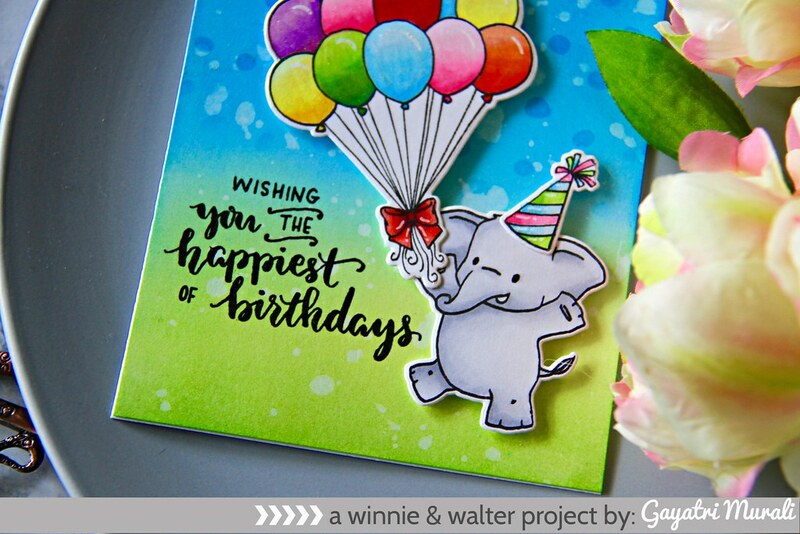 I stamped the images of the elephant, balloons and the birthday hat using black copic friendly ink, copic coloured them and die cut them using the coordinating dies. On the card front, I sponged and blended distress inks – Twisted Citron, Mowed Lawn, Salty Ocean, Mermaid Lagoon and Blueprint Sketch. I spattered clean clear water and dabbed them with a rag for added texture. Then I used the new spotty stencil and sponged distress inks Blueprint Sketch, Mermaid Lagoon over it. This added interest and gives the confetti like feel. I placed the die cut images on the card front on the MISTI and placed the sentiment and closed the door of MISTI. I removed the die cut images and stamped the sentiment using black ink. Then adhered the die cut images using foam adhesives. Then added highlights using sakura white gelly roll pen and brushed the balloons and hat with clear Wink of Stella. Thats it! Check out Winnie and Walter Blog for more inspirations. Here are the details of the big giveaway from Winnie and Walter Blog. I live this card, so adorable and the background is nice and bright. Cute little elephant. What a beautiful card. So bright and vibrant. I love elephants and this one is too cute. Absolutely gorgeous! 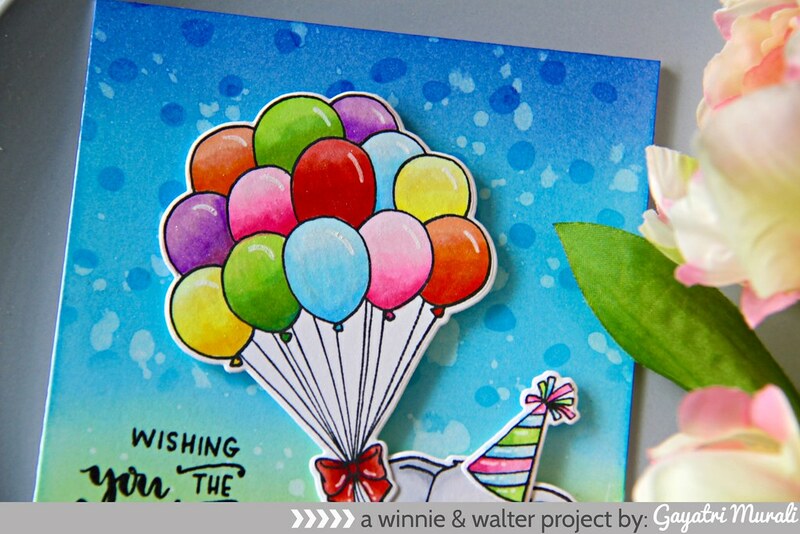 Wonderful and bright for a festive birthday card! Thanks for sharing your amazing cards/talent!